Check out the airplane propellors!! It went very well! The audiences were enthusiastic (two performances,around 900 people attended each). The propellers and the bell array worked fine, as well as our xylophone configuration and the drums (spread over the whole 22m of the stage, each with different instruments for the 'tone heights' of the score). Only one Disklavier stopped playing in the second performance. Although during the rehearsals one of them playedwhile all the other instruments were quiet and waiting for the downbeat"Play it Again, Sam"... It was great fun for the 15 percussionists! "Zeche Zollverein", now devoted to world cultural heritage (WeltKulturErbe). 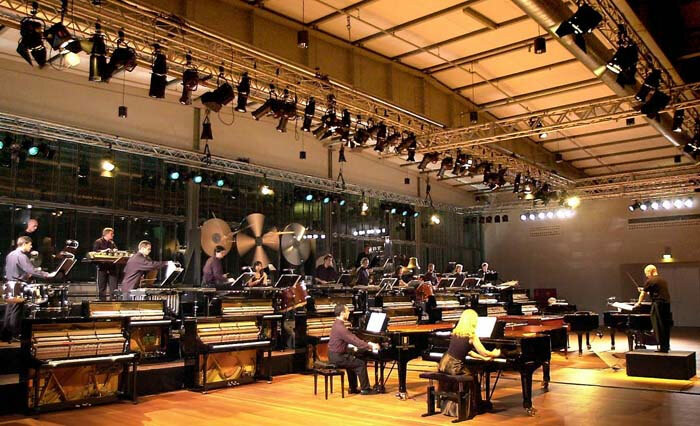 It was the climax and finish of a series of more than 60 concerts in 9 weeks: "Klavierfestival Ruhr" (www.klavierfestival.de) the world's greatest piano festival. Art director (künstlerischer Leiter) Franz Xaver Ohnesorg (now Intendant of the Berlin Philharmonics) devoted this festival to America: 18 of the 88 performing artists came from the USA and Leon Fleisher, famous American pianist, conductor and teacher was given an award for his life work. The Ballet was realized in the version Antheil had intended to perform in 1927 in Carnegie Hall. Conductor Dennis Russell Davies stands for precision and authenticity. Four handplayed grands, 16 pianolas, much percussion with bells, siren and 3 propellers - all without any electronic sound. The preparation took nearly a year. Three propeller machines and a set of bells had to be built. About 100,000 notes and accents were transformed into MIDI files, almost all by Dr. Jürgen Hocker, who was in charge of musicological and computer care and control for this concert. (Musikwissenschaftliche Beratung und computertechnische Betreuung). The Yamaha Disklavier uprights were collected from all over the country. 14 Disklaviers were positioned in two rows. Dr. Hocker's two Ampico grands stood in front, with the four hand-played grands beside. The percussion instruments were on a long platform above the pianolas. The controlling computer was situated together with the lighting controls on a desk in the auditorium. Very impressive also was the lighting: one spot for each piano and one for every musician. Colored lights illuminated the different phases of the music: for example, when the uprights were playing alone, all other lights were dimmed and only the long row of the uprights' white hammers shone in the darkness, performing chromatic clusters. The synchronisation was perfect and the huge chords sounded absolutely together - no trace of fast arpeggios. By the end, the light became bright in the hall and also came in from outside, as the whole building was illuminated. The applause and stamping were overwhelming, and even the many VIPs from the worlds of culture, politics and business clapped hands. George Antheil would have been satisfied! Finally all went well with the Ballet Mécanique. The performances were absolutely great and the sound was really perfect!! We had two performances, because the first performance sold out months ago, and so the organizer planned a second performance at 11.00 pm the same day. As you know (I think you are the only person in the world who knows this) the preparations were extremely difficult. There were different files needed for the [Ampico] player pianos and the different types of Disklaviers and Dennis Russell Davies wanted many tempo and dynamic changes during the piece. For example, since he didn't want any amplification, then to hear the live pianists, the player pianos had to play fairly soft, but only when the live pianists were playing. Other times, the player pianos usually played with full power. Davies tried a proper balance between all the instruments, and I think he succeeded. As we had two and a half days of rehearsals, we were able to get familiar with all the possibilities for failure, and the performance was great.They had a spotlight for each piano and for each musician. They built three propellers and a bell arrangement with maybe ten different bells. As I told you, we didn't use the Schirmer files [Dr. Hocker created his own files some years ago], but we used the click track (even that was slightly modified). Tomorrow I will go to Spain for at least four weeks to recover from all the trouble. 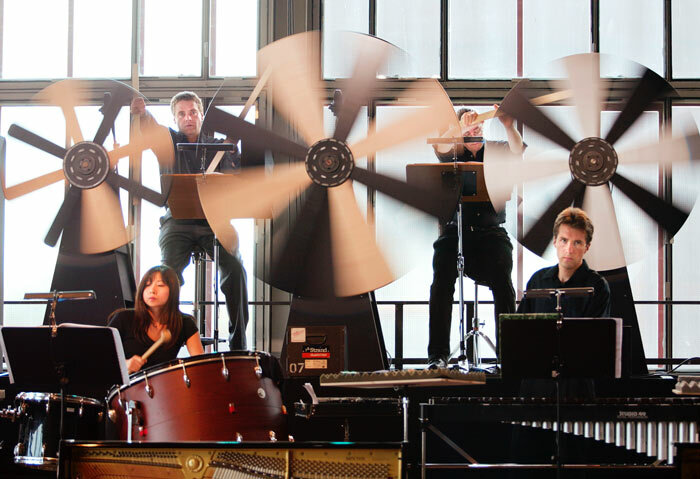 for 15 percussionists, 4 pianos and 16 player pianos. final concert of the "Klavierfestival Ruhr"
The Leger film and Antheil's music are brought together LIVE for the first time in history, at the keynote performance of the Percussive Arts Society International Convention.